Yoga has both preventive and therapeutic benefits. It has been shown to offer both physical and mental benefits to the body and the mind. The many physical benefits of yoga are: it improves flexibility and muscle joint mobility; strengthens, tones, and builds muscles; corrects posture; strengthens the spine; eases back pain; improves muscular-skeletal conditions such as bad knees, tight shoulders and neck, swayback and scoliosis; increases stamina; creates balance and grace; stimulates the glands of the endocrine system; improves digestion and elimination; increases circulation; improves heart conditions; improves breathing disorders; boosts immune response; decreases cholesterol and blood sugar levels; and encourages weight loss. 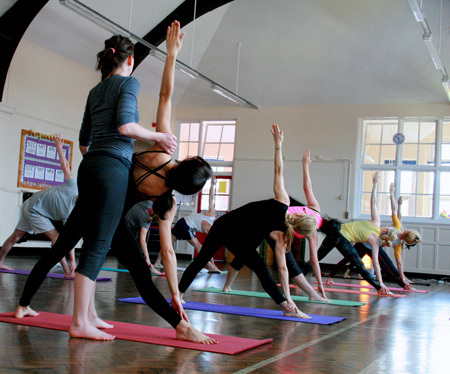 Yogo-Tara have been delivering yoga classes in Didsbury, Manchester for over seven years. They believe everyone is capable of feeling the benefits of and practising yoga. Their classes are of varying levels and are held in the beautiful halls of Cavendish Road Primary School, West Didsbury. We ensure our classes are friendly, fun and relaxed.